We created a course where web developer students got to learn and use hands on maker skills and development with microcontrollers. Web development students at the College of Higher Vocational Studies in Gothenburg (better known as YRGO since 2015) spent a month in a hands on learning project. The course was built around the maker culture and how you build physical interactive units out of microcontrollers. The students created interactive installations using Arduino boards and sensors of different kinds, communicating with computers running the Processing creative coding framework. Maker culture is a term that represents a community of people with a passion for creating things out of engineering-oriented techniques. This kind of knowledge has in the past couple years been more and more used in advertising, especially within areas of direct marketing, retail and trade shows. And, chances are that it will become even more common in the future as the use of wearable technologies and internet of things are only going to increase. It is therefore absolutely crucial for web developers to learn the basics of this kind of knowledge. In order to let the students test this kind of technology, we divided them into 11 different groups. Each group was then given the task to build an application that used any other kind of hardware than mouse and keyboard, either as input, output or both. We then supported them with development consultation, designing the UX and defining the minimum viable product. The students got to develop physical units and some of them even went on to buy their own microcontrollers. - The site is raised from the computer screen to diodes, projected images and mechanical constructions. It's fun to work with more analogue hands-on experiments, says Lars Simonsen, one of the students. 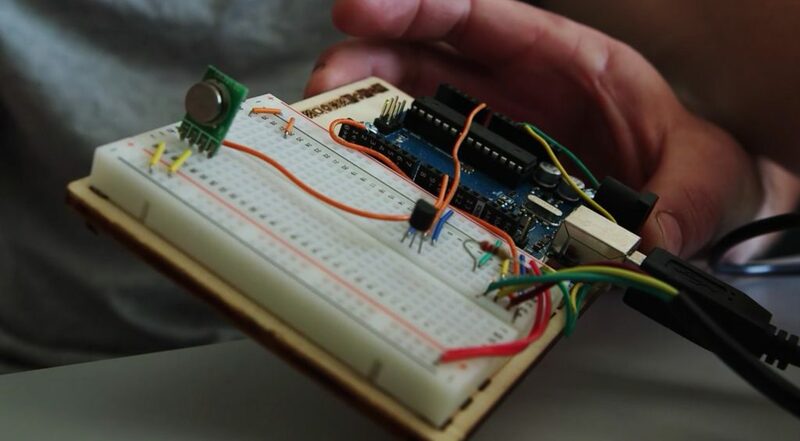 Working with this kind of development, closely connected to the hardware and with serial communication was new to almost all of the students. Yet, everybody was able to create a working application resulting in a wide spread of projects with different kinds of hardware, from a connected home system to a memory game. Want to know more about this project? Don' t hesitate to contact us.